Sectional diagram of the muzzle end of a Paradox-rifled barrel from The British Shotgun, Volume Two 1871 - 1890 by I M Crudgington & D J Baker, Asford, Southampton, 1989. Paradox - Holland & Holland's adopted name for a barrel boring system invented by G V Fosbery to allow use as an ordinary shotgun and also to be able to fire a single projectile with reasonable accuracy approaching that of a rifle. The barrel is smoothbore for most of its length. 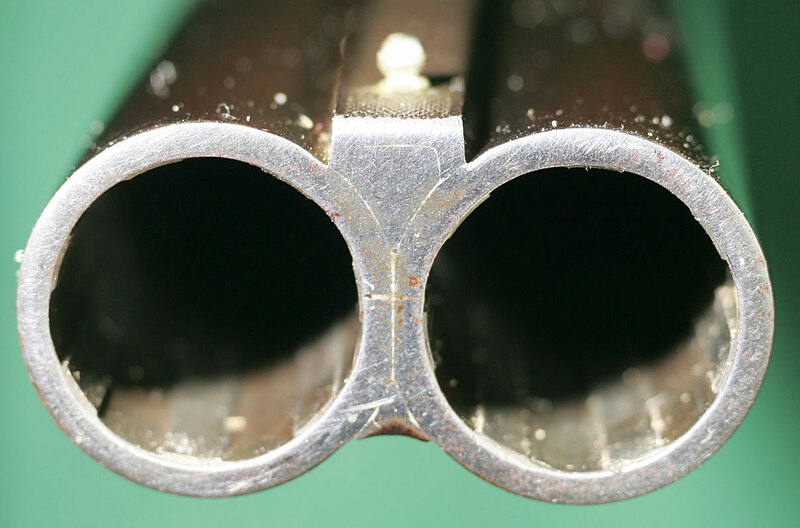 Then, about three inches from the muzzle, a normal shotgun choke begins its smooth constriction. Finally, about an inch and a half from the muzzle, a deep, robust series of spiral rifling lands and grooves are cut. Shot is not unduly effected by the rifling. A conical bullet or a slug is given a real spin by the rifling---achieving far superior accuracy to that of a modern “rifled” slug shot through a normal smooth shotgun bore. Also designated generically as a Ball & Shot gun. And, by Westley Richards as a "Explora" 12-bore or "Fauneta" 20 and 28-bore. A 16 Gauge Paradox. It can be used as a shotgun. Or, when used with a single projectile, bullet or ball, the inobtrusive folding rear sight may be raised into position.